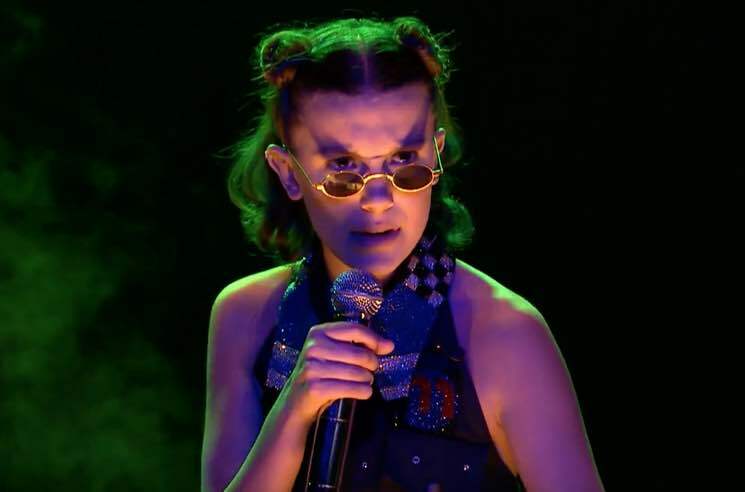 We already knew that Stranger Things star Millie Bobby Brown had a particular talent for spitting Nicki Minaj's "Monster" verse, but now she's brought her fast-paced rhymes to some Upside Down-themed content. The young actress appeared on The Tonight Show Starring Jimmy Fallon last night (October 31), and she helped eager-to-binge-watch fans catch up on the first season of Stranger Things with a customized rap. Joined by a hoodie-wearing Fallon as her hype man, she recaps the events that went down in Hawkins, IN, the previous year. It's all a little cringe-worthy, but endearing nonetheless — and a lot quicker than having to rewatch the complete series from the beginning. Check out Brown's return to rapping down below. Season 2 of Stranger Things is streaming on Netflix now.